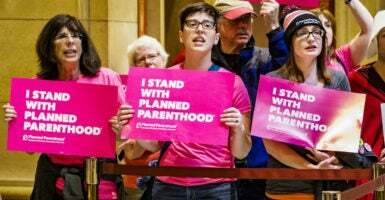 University of Minnesota students are petitioning the university to reinstate a fellowship for medical students that would have them working at and learning the ins and outs of procedure at a nearby Planned Parenthood clinic. “Our hope is that our voices are heard loud and clear,” petition co-author Trish Palermo said, according to the Associated Press. She explained that students were excited to begin the fellowship slated for the fall and that politics should not interfere with the school’s decision to move forward with the program. The petition is addressed to university President Eric Kaler as well as the dean of the medical school, Jakub Tolar. “The University of Minnesota should not allow partisan politics to influence education, particularly when it deprives our medical students of an opportunity to become further trained in essential reproductive healthcare,” the petition reads. The university decided to suspend the program on May 8 for a year to review the components of the fellowship after displeased students, parents, and pro-life groups became concerned that the fellowship would promote abortion. Funded by the Reproductive Health Access Project, the fellowship includes a field-work component that would send students to work at a Planned Parenthood clinic in St. Paul after finishing the program. The university contends that the decision was not solely of its own accord, and that the school had to consider funding coming from outside sources that were unhappy with the fellowship. Grace Carr is a reporter for The Daily Caller News Foundation.